It’s hard to imagine the last couple of years in Luxembourg without Giovanni Ferrario rocking the local venues once every few months. After his latest solo CD Headquarter Delirium was embraced favourably by fans and critics alike, he’s now back with GuruBanana, a band he has founded with Andrea Fusari. The latter may not be a household name yet, but he seems to be the head behind this project, writing all the songs, playing guitar and singing. The photograph inside the digipak could fool you into believing that Ferrario and Fusari are brothers, and although they are not, their interaction couldn’t be smoother. Named after a mid-Seventies Kevin Ayers song, GuruBanana have rooted themselves firmly in late-Sixties and early-Seventies avant-garde rock music, not unlike the genre practised by the former Soft Machine vocalist, although the Italian duo takes care to create their own sound. This sounds most vital on the opener Cold Water and the pounding Floor, two tracks that take advantage of a real band situation. The remaining material gets its beats from a drum computer, but its discreet programming somehow manages to enhance the private atmosphere of the music. What furthermore helps is Fusari’s truly engaging songwriting that achieves a stellar moment with the sparkling Sun Energy, one of the best songs I have ever heard in my life. Other highlights include Bucky-Bucky, a smart tribute to the sound of the Velvet Underground. Neighbour takes GuruBanana into ballad territory with an authentic sadness that manages to give me goosebumps every time I listen to it. Andrea Fusari and Giovanni Ferrario may have recorded their self-titled debut in a relatively short time, but you might as well think that these two have been playing together for half an eternity. Their songs sound coherent, catchy and convincing! Despite the programmed beats, you never feel outside the intended time period. 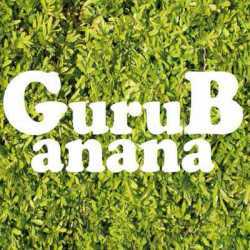 GuruBanana might as well have been recorded thirty-five years ago. It’s full of memorable songs that at no time sound derivative, at times you get even the impression that the artists that influenced them would have been happy to come up with such great melodies. Just like Lou Reed and Kevin Ayers, GuruBanana strip Seventies music of its arty progressiveness and remain with charmingly lo-fi avant-rock gems.